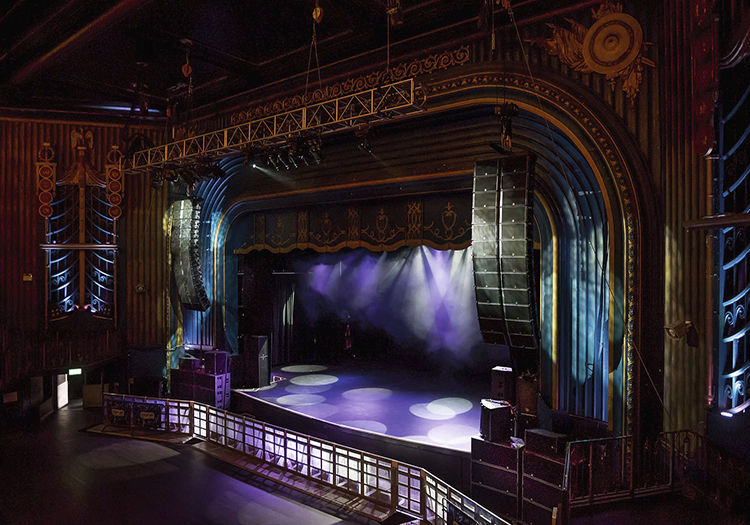 Adlib’s vast experience in live touring and venue installations, coupled with detailed research of current rider information, drove the specification of an L-Acoustics K2 loudspeaker system, DiGiCo consoles and Adlib’s latest proprietary MP5 wedges and side fills for the monitor system. The Adlib project team was headed by Installations Director, Roger Kirby, Service Manager, Rob Crossland and Senior Systems Technician, Tony Szabo, who studied the room and the audio requirements closely. They then designed and specified the system, and fine-tuned once the installation was complete in a close collaboration with the onsite technical team. L-Acoustics K2 was selected for its size and suitability for the wide variety of featured music and performance genres. To ensure the new system was fully optimised, Adlib recommended that the main PA points were upgraded and relocated to a new position. They worked with Academy Music Group’s appointed structural engineers, MJC Consulting on this element, so the new K2 PA arrays could be hung in the best positions each side. This precision was needed to cover the spacious balcony area and the wide areas offstage at the front. Additional low frequency support is offered by six SB28s a side, ground-stacked in two three-way wheeled dollies which position them at the ideal height in relation to the audience. Three L-Acoustics ARCS boxes a side on the inside edges of the sub stacks cover the nearfield and stalls areas immediately in front of the stage. All the L-Acoustics speakers are powered by LA8 amplifiers. A pair of Lake LM44 signal processors have been introduced at front of house to act as a front-end system input matrix, offering flexibility for house and visiting consoles. Twenty MP5s are also available at O2 Forum Kentish Town, all driven by Linea Research 44M20 4-channel amps, of which seven deal with the MP5s and another powers an Adlib AA215DS 2400W drum sub. A set of full range Adlib side fills were supplied comprising of an FD3P mid/high box, with AA215HL sub woofers. All the Adlib products onstage are driven via the presets on the Linea Research amplifiers. Two DiGiCo SD10 consoles have been supplied with D2 stage boxes, deployed at FOH and monitors, together with well-specified control options to complete a high spec rider-friendly system, with which most professional sound engineers will be familiar. Adlib then selected their own MP wedge system for monitors, which are also well-known and respected on touring and festival circuits. The latest MP5 version 15 inch monitor has improved drivers and output and has been very well received. Each and every item in the system has been carefully thought-through and is known, proved and appreciated by the audio engineering community. A new VDC multicore system with 48 input lines and 16 stage returns is part of the package, and AES signal lines to follow. John concludes: “It’s been another great experience working with Academy Music Group, and one that’s offered the chance to combine premium products in a powerful, practical and fantastic sounding solution at one of London’s premier venues”.